Looking for recommended lenses for this amazing entry-level DSLR? Take a look at our best lenses for Nikon D3400 camera. The Nikon D3400 is the first entry-level product enabled with SnapBridge connectivity. It has a 24.2-megapixel APS-C sensor without an anti-aliasing filter. If you are a new user or in touch for this digital SLR camera. You have only need to find the right or the best lenses for Nikon D3400. We have covered all lenses from Nikon and other companies and selected the best choices based on good price, usefulness and high image quality. Below are the top recommended and best Nikon D3400 lenses that are excellent for both complete amateurs and highly advanced photographers. You can choose the one you need. 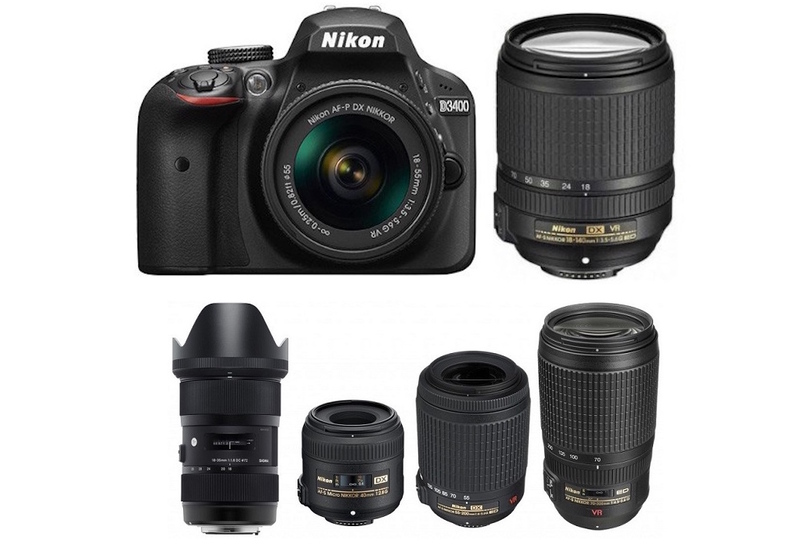 Nikon 18-300mm f/3.5-6.3G ED VR ($697): Outstanding all-in-one telephoto zoom! It would be the best choice if you want to pick only one lens for Nikon D3400. Surprisingly compact and lightweight for a 16.7x zoom lens, the Nikon 18-300mm f/3.5-6.3G ED VR draws great performance for Nikon DX-format DSLRs. You can shoot just about anything from stills, videos, landscapes, interiors, portraits to wildlife with this lens. Nikon 40mm f/2.8G Micro ($277): Ideal for shooting close-up photography. The 40mm focal length is great for product, bug, portrait and even casual photography. This Nikon 40mm f/2.8G Micro allow users to get true 1:1 magnification for extremely close-up imaging. It’s designed for DX cameras which the D3400 is, so AF and image quality are top notch. Tokina 11-16mm F/2.8 ATX Pro DX II ($499): Budget-lens with great image quality. The Tokina AT-X 11-16mm f/2.8 PRO DX II ultra wide-angle zoom has a bright constant F2.8 aperture make viewing and auto focus possible in lower light situations. This would be the best option for new D3400 users who are interested in landscape photography. Sigma 18-35mm f/1.8 DC HSM Art ($799): Highly recommended lens to buy for Nikon D3400. The Sigma 18-35mm 1.8 DC HSM Art lens is a new benchmark in photographic history. It is the first wide-angle to standard zoom lens to achieve a large aperture of 1.8. The Sigma 18-35mm f/1.8 Art is ideal for landscapes, portraits, still life, snap shots, casual, and close-up photography.